Thursday, November 10, 2011, 6 p.m. It was 90 years ago this fall that the first public education film about cancer was released by the American Society for the Control of Cancer (today the American Cancer Society). Cultural Programs of the National Academy of Sciences will screen a restored copy of The Reward of Courage (1921) together with a live performance of a specially commissioned musical score by Maurice Saylor. This is the first time in more than 60 years that the film has been screened in public. The Reward of Courage was a pioneer in public health education. Released to coincide with the first national cancer week, it sought to transform public ideas about cancer by introducing the notion that early detection and treatment by a recognized physician was the best way to ensure successful interventions against this group of diseases. It embedded this message in a melodrama that warned against a nefarious ‘quack’, invited audiences to sympathize with a vulnerable woman endangered and a young couple thwarted in love, and told of the story of a hard-hearted businessman converted to the idea that an industrial clinic could improve worker health and productivity, increase company profits, and detect cancers. The movie provided a template for the many thousands of educational films about cancer produced in the 90 years since 1921. It will be introduced by the historian David Cantor who will talk about the discovery of this film and its historical significance, and Maurice Saylor who will talk about the process of composing a score for this film. The Reward of Courage lasts about 30 minutes, and the program will also include a special showing of a Harry Langdon comedy Lucky Stars (1925) in which Harry Lamb (Langdon) meets a huckster called Hiram Healy (Vernon Dent), and mayhem ensues as Harry and Healy try to sell a cure-all in the Mexican town of San Tabasco. 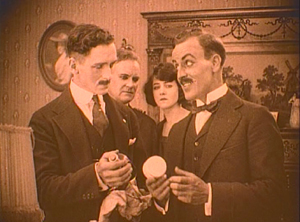 The Reward of Courage (1921) (30 minutes). Produced by the Eastern Film Corporation for the American Society for the Control of Cancer. Lucky Stars (1925) (21 minutes). Produced by Mack Sennett Comedies, starring Harry Langdon, Vernon Dent, and Natalie Kingston. The music for both films will be performed by the Snark Ensemble.